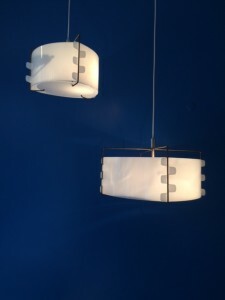 Rare M2 and M3 ceiling lights by Joseph André Motte at Galerie Pascal Cuisinier for Art-Saint-Germain des Pres. Motte was one of the first French designers to use perspex in this specific interlocking design. Each light is made up of four interlocking perspex leaves. The 17th Edition of Art-Saint-Germain-des-Pres takes place this weekend featuring 59 art and design galleries in the area. The streets of Saint Germain around rue de Seine were alive with energy for last night’s opening of Art-Saint-Germain-de-Pres. 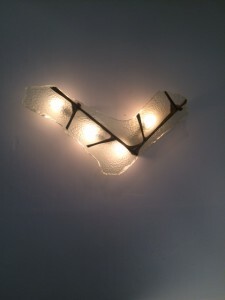 People we spoke with are genuinely interested in the pieces exhibited and there was a high level of connection. 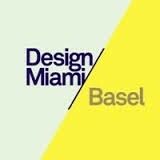 With an approximately even distribution of art and design galleries, there was a lot to see with vast diversity and high quality. 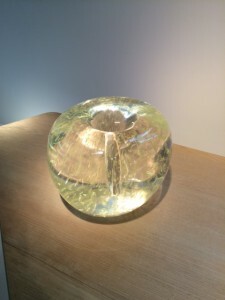 These parcours which spotlight specific areas in Paris create a great buzz and a real opportunity to meet the dealers and explore the galleries in depth. One minor thing – a couple of the galleries advertised on the parcours closed at 7pm rather than the expected 10pm. 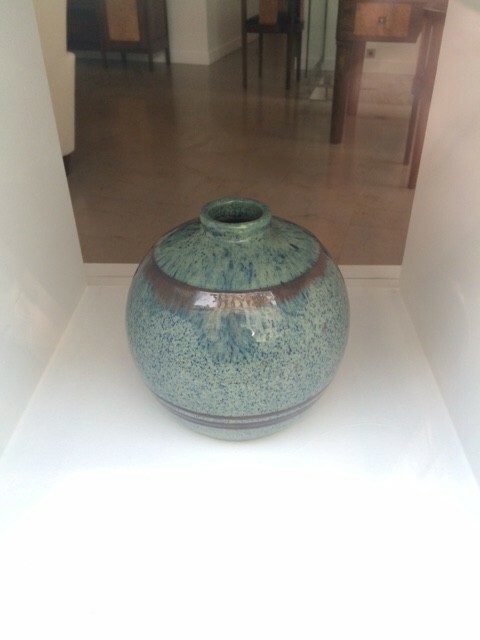 Ceramics took a prominent place at several of the design galleries. Here are a few highlights from last night’s opening. Enjoy! 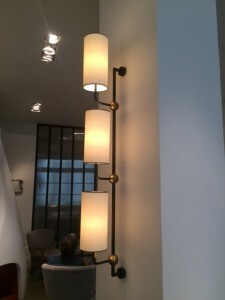 Wall light by Max Ingrand c1960. Galerie Jacques Lacoste. 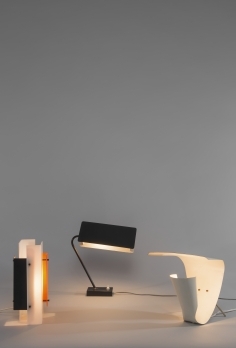 Wall light by Jean Royere 1967. Galerie Jacques Lacoste. ‘Tokyo’ commode by Charlotte Perriand; and Wall panel (1966) by S. Thomas States, Galerie Downtown. Rocking chair (1950s) by Pierre Guariche, Galerie Pascal Cusinier. Ceramic vase (1949) by George Jouve, Galerie Jacques Lacoste. 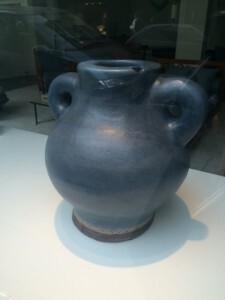 Ceramic vase by Francis Jourdan (1930s), Galerie Doria. 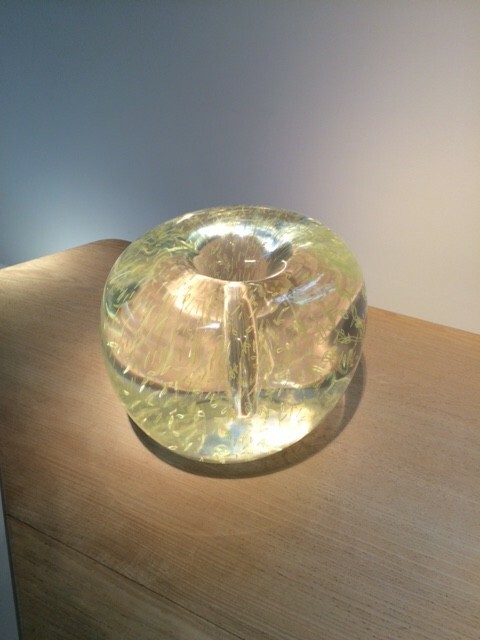 ‘Sciami’ vase in plexiglass (2007) by Andrea Branzi, Galerie Downtown. For up to the minute collectible design news, discussions and visual inspiration join us on social media. Instagram and Pinterest – daily inspiration. On Linkedin we invite you to join: Design Link – Collectible Design Market Network – a growing network of resources, designers, journalists, collectors and enthusiasts discussing ideas and questions about this growing market. Sotheby’s Paris Design Sale on 21 May realized a sale total of €7m and attained some record prices. 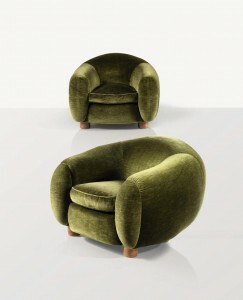 €543,000 world record price for this pair of fauteuils ‘Ours Polaire’ by Jean Royere, far exceeding the estimate of €120,000-150,000. 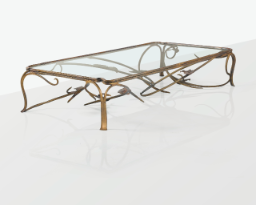 There was a nail-biting bidding battle over this extraordinary table by Claude Lalanne which finally realized €471,000 with a high estimate of €120,000. 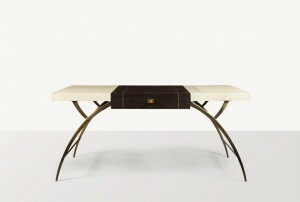 At Artcurial’s Art Deco sale on 26 May, a little under a third of the lots were unsold, among these some big lots failed to find buyers: Low table by Paul Dupré-Lafon (estimate €60,000-80,000) and an exquisite walnut and brass table à jeux by Eugene Printz, 1930 (est €25,000-30,000). 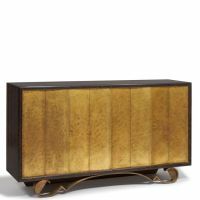 However, several other pieces by Eugene Printz found buyers and exceeded their estimates: a beautiful buffet (c1938) sold for €187,800 (image above) with a high estimate of €80,000 and a bureau (lot 60) went at €163,500 (high estimate €70,000). 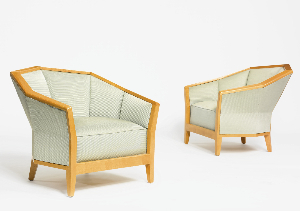 Look out for this spectacular pair of MF172 armchairs by Pierre Chareau (est $150,000-200,000) in Sotheby’s New York 20th century Design sale 9 June. We posted one on instagram recently in the permanent collection of the Musée d’Art Moderne Paris. Cornette de Saint Cyr’s sale of Decorative Art of XXe siecle will be held in Paris on 8 June at their 6 Avenue Hoche premises. 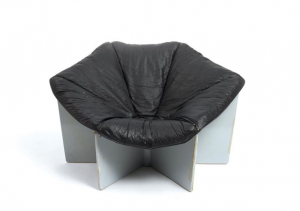 This ‘Arachnéen’ fauteuil (above), edition Artifort c1975, by Pierre Paulin is spectacular. 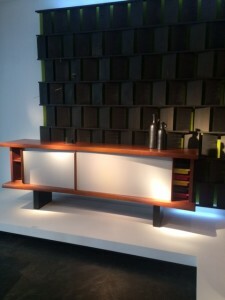 The frame itself has a superb sculptural quality. Estimate 3,000-5,000. 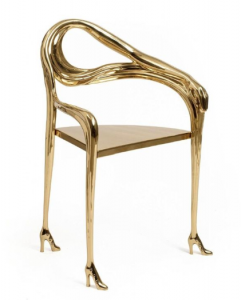 Three-legged ‘Leda’ fauteuil-sculpture by Salvador Dali (1904-1989). Estimate €20,000-30,000. D’Days – The 15th annual Designer Days Festival takes over Paris from 1-7 June with a huge range of incredible opportunities for guided exhibition visits, meeting with designers, talks, gallery visits, product introductions and more. There is a really cool app for this festival that we just downloaded. It’s free and available on itunes. Try it here! 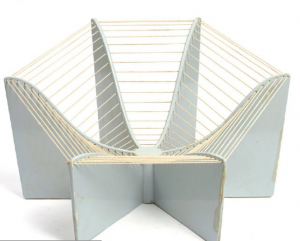 Galerie Pascal Cuisinier will be featuring the work of Jacques Biny at Miami Basel this year. 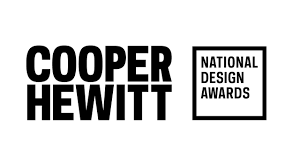 The Cooper Hewitt Smithsonian’s Annual Design Award Gala will take place on 15 October this year. Click here to find out more and reserve your place. 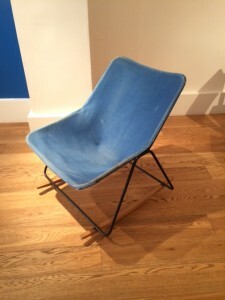 Congratulations to Sara Ouhaddou, one of our favorite young designers, who was a LaunchPad award winner at WantedDesign in New York earlier this month. 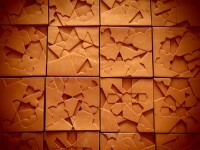 Read the article in Design Milk. A great Q & A in BlouinArtInfo with Ambra Medda, one of the most inspiring women in design today.